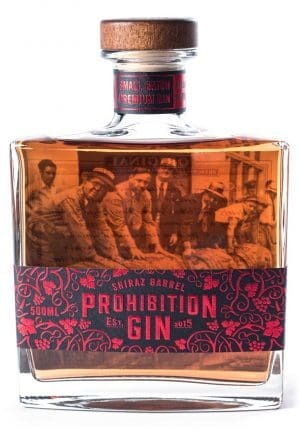 MOVE OVER SHIRAZ GINS AND BARREL AGED GINS, HERE IS THE NEW STANDARD: PROHIBITION SHIRAZ BARREL AGED GIN! A 60% EXPRESSION OF THE ORIGINAL GIN HAS BEEN AGED IN CUSTOM COOPERED BARRELS WHICH FORMERLY HELD AMERICAN BOURBON, THEN MOST RECENTLY BAROSSA VALLEY SHIRAZ – RECHARRED AND NOW GIVING NEW LIFE TO THE SHIRAZ BARREL AGED GIN. THIS OVERPROOF BLUSH COLOURED SPIRIT IS SOFT AND SILKY WITH A GENTLE SHIRAZ NOTE AND RICH OAKED RYE BACK-NOTE. IT’S PUNCHY, YET STILL MAINTAINS THE VANILLA AND FLORAL NOTES WHICH DEFINE PLC GINS – PERFECT ON ICE, WITH SODA OR IN YOUR FAVOURITE COCKTAIL!